GUEST BLOG: No-nonsense blogger Jill tells it like it is and it's a great read! In this post, we return back to her BATTERED SUITCASES blog to follow her adventures on her favourite Fraser Island day - that would be day 2 with the cool peeps from Cool Dingo Tours! Click here if you want to find out what happened on Day 1 with Jill. My favorite day. 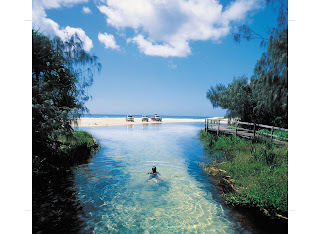 Day Two of our Fraser Island tour started off with a very filling breakfast and a bumpy ride across the island. The bus was nearly silent as everyone concentrated on not getting motion sickness. Despite the rough start, this day was my favorite of the two day tour. After bouncing across the width of the island we emerged from the forest onto Seventy-Five Mile Beach. My stomach welcomed the long and flat stretch of sand that functions as a highway. Driving so close to the surf was also quite the thrill. The first stop of the day was at the Maheno shipwreck. The ship was washed ashore in 1935 while on its way to Japan and has been resting on the sand ever since. Due to the condition of the wreck, visitors are not permitted to touch or climb on it. The chunk of metal just screams tetanus. 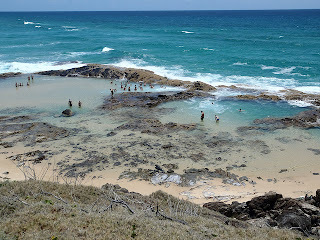 Our next destination was The Champagne Pools, a definite highlight of the day. Water erosion created several pools in the rocks that fill with water as the waves roll in. The foaminess of the water makes it sparkle...hence the name "Champagne." The day was hot and everyone was eager for a refreshing swim. Due to strong currents and sharks, the pools are one of the only places you can swim in ocean water on the island. I was a bit reluctant to leave the pools but of course there were more amazing places in store, like Indian Head. Indian Head required a bit of a hike but it was well worth the effort. From the headland you have an amazing view of the island and wildlife. We were able to spot sharks, rays, and turtles swimming in the waters below. Shark attacks are always in the back of your mind while on the beach in Australia... but actually seeing a shark's shadow is a bit unnerving. Thank goodness we were high above the water! Our last stop of the day was at Eli Creek. Eli Creek is another popular swimming spot but unlike The Champagne Pools, you're swimming in freshwater. Well, more like floating. All you have to do is walk upstream a few hundred meters along a platform, and then float yourself back down. Mike floated while I walked downstream beside him (the water was really cold!). It almost felt like a ride at Atlantis or Wild Wadi. Unfortunately, our time at Eli Creek was stretched out much longer than expected due to an emergency elsewhere on the island. Another bus broke an axle and when the driver attempted to fix it the jack broke as well. The bus came down on the driver's hands and smashed his fingers. Naturally, as soon as the call came over the radio, our driver rushed off to help. The scary thing about being on Fraser Island is that medical attention is a good distance away. I think someone said a helicopter was coming to pick up the driver and take him to the hospital. We ended up loading as many people from that bus onto ours as possible so that they wouldn't be stranded on the island. Everyone was a really good sport but I'm sure it was a traumatic experience. (Note from Editor, the tour guide/driver is doing well - he was transported to the local hospital in good spirits). At this point we also spotted a dingo! Everyone had their eyes wide open looking for one both days. 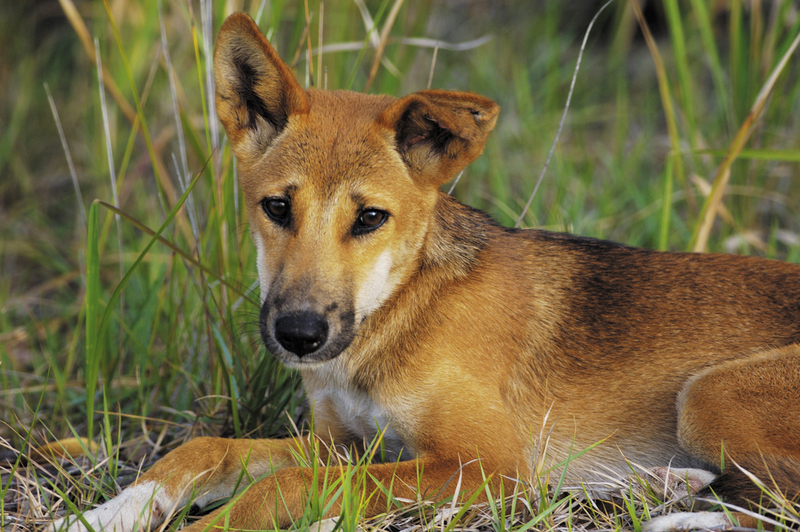 Fraser Island dingoes are the last remaining pure dingoes in Australia (dogs are not permitted on the island to keep it that way). It was definitely exciting to see one, but I'm glad it was from the safety of the bus. Plenty of precautions are taken on the island to keep people safe, but visitors have been bitten before. Ouch! Later in the evening we returned to the resort for another swim and some dinner. We hopped back on the ferry and returned to the mainland fully satisfied! So, would I recommend a tour? Yep! (Another note from the Ed - check out our previous blog post for all of Jill's reasons to join us on tour). So where to from here? Jill's off exploring the Whitsundays and beyond - if you want to follow her Australian east coast adventures, check out her blog - Battered Suitcases. Content has been reproduced with the author's permission. Cool Dingo fans are always welcome on Twitter... and you can even bag yourself a tour discount if you friend us on Facebook.